Bridgeport / EZ Trak 2-Axis CNC Vertical Mill s/n 274191E w/ EMI CNC Controls, 2Hp Motor, 60-4200 Dial Change RPM, Chrome Ways, 9” x 48” Table. Bridgeport / EZ Trak 2-Axis CNC Vertical Mill s/n 261186E w/ EZ Trak SX CNC Controls, 2Hp Motor, 60-4200 Dial Change RPM, Chrome Ways, 9” x 48” Table. Kia “Super Kia Turn 15E” CNC Turing Center s/n SKT15017 w/ Mitsubishi Meldas M50-L CNC Controls, 12-Station Turret, 5000 RPM, 13.78” Max Turning Diameter, 16.14” Max Turning Length, 6 1⁄2” 3-Jaw Power Chuck, 5C Collet Nose, Coolant. Victor mdl. 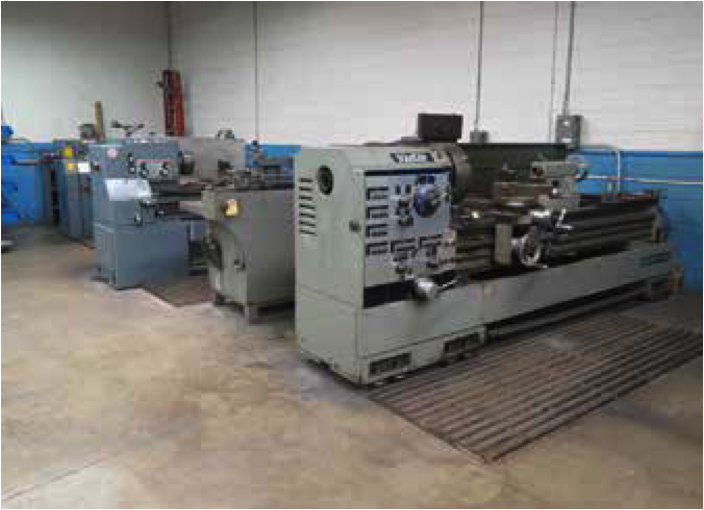 2480 24” x 80” Geared Head Gap Bed Lathe s/n 91002 w/ 21-1500 RPM, Taper Attachment, Inch/mm Threading, Tailstock Steady and Follow Rests, KDK Tool Post, 16” 3-Jaw Chuck, 14” 4-Jaw Chuck, Faceplates. LeBlond Regal 18” x 82” Geared Head Lathe s/n 6E1093 w/ 40-1600 RPM, Taper Attachment, Inch Threading, Tailstock, Steady and Follow Rests, Trava-Dial, KDK Tool Post, 16” 4-Jaw Chuck, 12” 3-Jaw Chuck, 9” 6-Jaaw Chuck, 5C Collet Closer, Faceplates. LeBlond 15” x 32” Geared Head Lathe s/n12C-1341 w/ 45-1800 RPM, Inch/mm Threading, Tailstock, 5C Collet Closer, 7 1⁄2” 3-Jaw Chuck. Shibaura BT-8CR Horizontal Boring Mill s/n5830 w/ Sony 3-Axis DRO, 20-1000 RPM, 35 1⁄2” x 41 1⁄2” Rotary Table, Power Feeds, Steady Rest with Optical Readout, (2)12” x 36” Angle Fixture Plates. Bridgeport Series 1 – 2Hp Vertical Mill s/n227702 w/ Bridgeport DRO, 2Hp Motor, 60-4200 Dial Change RPM, Chrome Ways, Power Feed, 9” x 42” Table. Bridgeport Series 1 – 2Hp Vertical Mill s/n194955 w/ Sony DRO, 2Hp Motor, 60-4200 Dial Change RPM, 9” x 42” Table. Hauser Type 5 Bridge Style Jig Boring Machine s/n 27 w/ 330-2000 RPM, 20” x 28” Travels, 24 1⁄2” x 29 1⁄2” Table, Hauser Tooling Cabinet with Hauser 8” Compound Rotary Table, Hauser Tooling Set with Boting Heads, Setting Scope, Indicator Set, and Tooling Holders. Solberga mdl. SE275 Geared Head Pedestal Drill Press s/n 7877 w/ 120-1548 RPM, 8-Speeds, Power Feeds, 17 1⁄2” x 21 1⁄2” Table. Grob mdl. 4V-18 18” Vertical Band Saw s/n 4543 w/ Blade Welder, 40-5000 FPM, 24” x 28” Pneumatic Feed Table. Harig “Super 612” 6” x 12” Surface Grinder w/ Walker Electromagnetic Chuck. Quincy QT-5 5Hp Vertical Air Compressor s/n 20080520-0087 w/ 60 Gallon Tank. Nugier mdl. H20-6 20-Ton Hydraulic H-Frame Press s/n 1221. Black & Decker Pedestal Grinder. Lincoln Square Wave TIG 300 Square Wave AC/DC TIG Welding Power Source s/n AC672403 w/ Dyna-Flux Cooler and Cart. Miller Millermatic 251 Arc Welding Power Source and Wire Feeder s/n LG040123B. 5’ x 8’ Steel Welding Table. Wohlhaupter Large Cap Facing/Boring Head. 10” x 12” Sine Table. 6” x 12” Compound Sine Table. Equipto 7-Drawer and 6-Drawer Tooling Cabinets. Power and Pneumatic Power Tools. Mitutoyo 36” x 60” x 10” Grade “A” Granite Surface Plate w/ Stand. Starrett Crystal Pink24” x 36” x 6” Granite Surface Plate w/ Stand. Mitutoyo 24” and 12” Dial Height Gages. Mitutoyo OD Mics to 18”. Brown & Sharp 0-6” OD Mic Set. Mitutoyo, Intast and Diatest Dial Bore Gages. Sigma 6” x 9” Bench Center. s/n 85K671 w/ 2-Stage Mast, 146” Lift Height, Solid Tires.